Do you want some success tips you can use right now? Are you getting impatient waiting for your success to skyrocket? There are success tips you can put into action today and become immediately more successful. A few simple little tweaks to what you are probably already are doing and you can amplify your success quickly. I created this Ultimate Guide of Success Tips so that you have all the tools you need to be successful right now. Making your bed every day is a great habit of successful people. It may not seem like much, however it is one of the easiest success tips you can follow. Not only does your bed look great, it may even help improve your sleep! Studies have shown that people who had a fresh, clean and made bed slept better than those who did not. Try an experiment, make your bed and see if you get a better nights sleep. Position your bed in the middle of the room. If your bed is next to a wall it can make making your bed difficult. Who wants to climb on a bed and wrestle with sheets and blankets when you could easily just walk around it and make the bed? Keep your bedding simple. A top sheet and a comforter or quilt is plenty. If you are cold don’t go adding more blankets, just find warmer ones. There are even fleece sheets that keep you nice and toasty. Pair that with a down comforter and you should be warm enough even for the coldest of nights. On the flip side, don’t make your bed too hot either. Nobody needs to be a sweaty mess in the middle of the night. Zip up your bed. That’s right, you can use zippered bedding with Beddy’s. Beddy’s bedding is great for adults and children alike. They have such beautiful bedding and they put everything together and all you have to do is zip up your bed. Brilliant right? Everyone is always trying to squeeze more time out of the day. The place we can usually find more time is when we wake up early or stay up late. Stealing time from sleep causes a sleep debt and according to the National Sleep Foundation it is a debt that needs to be repaid. A sound machine is great for blocking out noise. The white noise helped our children sleep like champs when they were little. If you don’t want to buy a machine, you can always use an app that has different sleep sounds. You can even have your app play sounds of the ocean. Keep your room dark. Blackout curtains can help a lot. Blinds are a popular choice, but they only offer privacy and don’t do much to help with darkness. If you add some blackout curtains, you can sleep in total darkness. I recently found some really nice ones at Costco for $20 what a score! Turn off electronics at least an hour before bed. Electronic devices emit electromagnetic frequencies that can interfere with your sleep. If you are waking at the same hours each night one or more of your organs may need cleansing. I used to wake up at the same hour every single night and would not fall back to sleep for two hours. I checked the Chinese Organ Clock and sure enough I needed to do a liver cleanse. I cleansed my liver and I was able to once again sleep through the night. Keep your room cool. The best temperature for sleeping is on the cool side. However, whatever is comfortable for one person may not be for another. A good rule of thumb is to make it as cool as you can yet not so cold that it wakes you. Did you know when you go 17-19 hours without sleep it is almost the equivalent to being legally drunk? That’s a good reason to make sure you get enough sleep! What kind of list of success tips would this be if I didn’t include making lists? Making lists are great because you can free up your mind to do other things rather than to remember small bits of information. When you make a list, you relax knowing that you won’t forget anything. Making a list can save you time and money. How many times have you run to the store and forgotten your list? What happens if you forget things and have to use gas to run back again? You can actually save time by setting aside a few moments to make a list. Or you packed for a trip and forgot an expensive item only to have to go out and buy another one? Without a list we lose valuable time and money which is the opposite of our goal. Lists are planning tools and can really help you Plan Your Way to Success. Some of the most successful people in the world today used visualization to achieve their goals. You visualize the end result, something you want to achieve, close your eyes and see yourself achieving it! So once your vision becomes so realistic in your mind it cannot help but become a reality. Create a vision board. A vision board is a board that you put all your dreams visions onto by cutting out pictures and gluing them onto the board. Poster board is great to use for this. You can paste your pictures on the board, leaving some white space between the pictures. Use the white space to write what the pictures represent. Don’t be vague. Record an audio track. Using the voice recorder on your phone, explain in great detail what your vision is and how you are going to achieve it. Play your audio track to yourself on a loop using headphones. Let it sink down deep into your brain. Headphones are key because you can really concentrate when you use them. Create a video. Using PowerPoint, you can create a video from images of all of the dreams you want to achieve. A video can help you keep your eye on the prize, while staying focused. Posters can be a tool to help you visualize. Growing up, posters had a lot of effect on me. Posters are a vision that you constantly see, posters are great. Making your dreams into a poster to see every day can impact you for life because they are always right in front of you. “Hang in there.” There was a picture of a kitten hanging on a tree limb. “You can’t soar like an eagle if you are surrounded by turkeys.” Funny because it’s true! Those three visions kept me hanging in there when I wanted to quit, understand that I needed to surround myself with successful people, and thanks to Jerry Seinfeld I always floss my teeth. Success Tip 5 – Trim the fat. If you want to fast track your success, you cannot spend your time with people that don’t have similar goals. Successful people have a lot of haters. The best way to rid yourself from the negativity is to move away from it. In order to be a high achieving individual you have to trim the fat. Be protective about who you allow into your inner circle. Sometimes it can be difficult to find people with similar goals. People crave companionship, but honestly it’s better to have one great friend instead of a bunch of mediocre ones. This may sound harsh, but if you are spending your time trying to achieve your goals you don’t have time for anyone not in alignment with your goals. No one has an infinite amount of energy. The energy you have has to be focused on your goals. It can be really difficult to shake off the negative people in your life, especially when they are family. You don’t have to close off all communication (unless the relationship is completely unhealthy then by all means close it off) but you can bring the relationship down to a lesser amount. Whatever that amount is only you will know. They talk and never listen. They put you and all of your hopes, dreams, and ideas down. You feel worse than you did before you spent time with them. They drain you of your energy and creativity. This person makes you feel happy when you are with them. They can make you laugh. This person is a cheerleader for your hopes, dreams, and ideas. A person that can listen as well as talk. They don’t judge but they do give you a reality check when you need it. Successful people have good routines. Everyone has routines, they just are not always good ones. An unorganized person may be in the routine of coming home from work and laying their dirty clothes on the floor. A routine is easily one of my favorite success tips to do because it’s something written that you can follow. You can have all different kinds of routines. When you are new to routines, start with a morning and an evening routine. Making a morning and evening routine is super easy, plus those are two of the most important routines. Morning and evening routines are important for success. Hygiene is addressed in both morning and evening routines. You can also use your evening routine to plan out the next days productivity. A morning routine helps you have a successful day. You can create a book with their routines so that your kids have a fun way to accomplish their routines! Kids love to check off each item as they complete it. Having a routine it almost puts you on autopilot and you are able to easily complete your tasks without any resentment. There are many more routines. You can create a routine to fit whatever activity it is that you do. Having a routine makes everything run smoother and easier. If we aren’t robbing time from our sleep the next best place to rob it from is our fitness routine. We have so much to do all the time, how easy is it to forget about exercising? It’s really important to stay healthy because our health is our wealth. Without your health you cannot perform at your top level. Exercise helps us be happier, live longer and enjoy much more productive lives. Exercise can be a great stress reliever too! Plan your exercise ahead of time and write it into your schedule just as you would put in an appointment. Pick an exercise that you LOVE. Do something that you always wanted to try, rock climbing, pole dancing, hula hooping, skiing, what ever it is just try it you may love it and it will become a great source of joy to you while you boost your fitness! Switch it up. Keep your exercise routine varied so you don’t get bored. Take your exercise outside. Gyms can be intimidating. They don’t always smell the freshest either when they are full. You can take your workout program outside and breathe in nothing but fresh clean air. Start out slow. Don’t push yourself too far and too fast or you may become injured and you won’t be able to exercise at all. One of the most surprising success tips is that eating right means different things for different people. I am a firm believer in Eight Constitution Medicine. My family has changed forever because of Eight Constitution Medicine. The premise is that according to your constitution you have strong organs and weak organs. If you feed your strong organs, they get stronger and your weak organs get weaker and you become unbalanced which leads to sickness. If you feed your weak organs, they get stronger and you become balanced which leads to health. The Miracle of Eight Constitution Medicine in My Own Home. My husband was always sick. Our running joke was that if he talked to someone on the phone who was sick, by the time he hung up he would be sick too. I didn’t get sick and I thought it was because I was vegan, we tried that out for him and it failed miserably. Sometimes you have to be a detective to understand what is right for your body. We finally found a doctor who knew exactly what was the problem. My husband was meant to eat meat and lots of it! Surprisingly enough he can eat meat but not chicken. Chicken causes skin issues for his constitution. Beef and nuts and to be the main staple of his diet, and absolutely no lettuce or cabbage. My hubby changed his diet three years ago, and he hasn’t been sick a day in his life since then. Because of Eight Constitution Medicine he is the healthiest he has ever been in his life. Before I found out about Eight Constitution Medicine, I was vegan. Vegan is actually pretty much how I’m supposed to eat for my constitution and I never really got sick which now makes sense. I was also eating wheat that I should not have which explained a lot about why I was getting injured so often. So I didn’t get sick before, but I did have many injuries! Ever since I changed my diet I’ve been injury free. Eating right for one person isn’t eating right for another. You know how sometimes a person becomes a vegan and they look awful? They are not healthy and don’t feel good at all. Yet another person cannot eat meat and stay healthy? There is a reason for that, it is due to the fact that those people have different constitutions and are not eating their best diet! Find what works for you. Everyone has that one old relative or knows of a person who ate bacon and drank coffee every day and never was sick a day in his life and yet lived into his 90’s. Those foods were for fine for his constitution. Someone with my constitution would probably die by the time they reached 40 following that type of diet. What can YOU eat that makes YOU feel good? There is no one size fits all approach to eating right. Of course there are general rules like fresh and organic is best, but what you should be eating isn’t always what the so called experts recommend. Another one of my favorite success tips! A mantra is an amazing tool to catapult your success. Your mantra is your catchphrase that you repeat as often as you can. Make your mantra positive and something that helps you achieve your dreams. Find your mantra and you find a key to turn your dreams into reality. Here is a success triple threat – Write it, read it and speak it! When you do all three of those things you will be a triple threat in the realm of success. The reason a mantra is so important is that the more often you speak it, the more it gets down into your brain. Because once your mantra becomes a part of you there is no way it can stop from happening! You can write your mantra and not only speak it. Writing your mantra on a daily basis is a sure fire key to your success. To make your dreams become a reality be sure to write, read and speaking them until they are achieved. Yes a mantra is THAT powerful. Sometimes we get so caught up on where we are going that we forget to be grateful for what we already have. Even on your worst day if you take a few minutes to reflect on what blessings you already have you will turn that bad day around. Gratitude is something that can be cultivated. It’s not always easy to be thankful for the good things because we are often surrounded by bad things. Spend a moment each day writing down one thing that you are grateful for. This will have a positive impact on your entire life. That one conscious act can spill over and help change your entire attitude for the better. No one is perfect, and no matter how hard we try we never will be perfect. Just because we will never be perfect doesn’t mean we should strop trying to improve. There are always better ways to do things, new things to learn and nicer words that can be said. Don’t try and fix everything all at once, you have a lifetime to become a better person. If we never reflect on what we can improve we won’t ever be able to improve. If you have the same problem with every person perhaps the problem it isn’t with them, maybe that problem is you. No one is perfect, but there is a true beauty in being willing to learn. 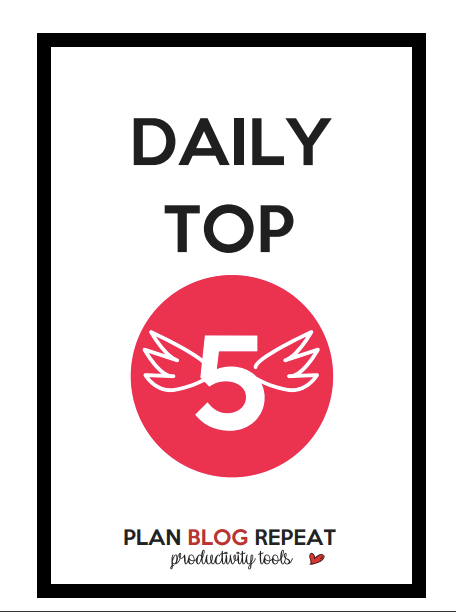 I’d like to help you plan your success, I’ve compiled five success tips into a daily top five that you can download and print and put some of these success tips into action right away. Spending a few minutes each day working on your success will give you no choice except to be extremely successful. Which success tips are your favorites? Which ones are the hardest for you? Let me know in the comments I’d love to hear about it. Thanks Holly I’m glad you enjoyed them! Such great tips, thank you.